While we give credit to Thomas Smith-Webb for his publishing one of the first standardized monitors in the US, we must not forget the efforts of William Preston who had a major influence on Thomas Smith-Webb's work as well as many other monitors. 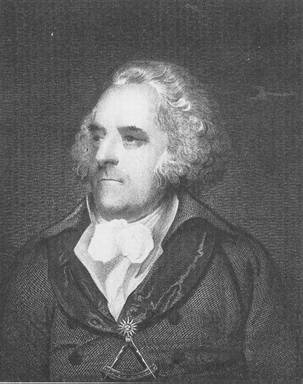 William Preston was born on August 7th, 1742, in Edinburgh, Scotland. At the age of 6, his father had him attend the Royal High School in Edinburgh, where he is said to have studied Latin and Greek. He continued his studies of the classics through college and once he had finished his studies he worked for Thomas Ruddiman, a linguist, and after Thomas' death worked for his Walter Ruddiman as a printer. In 1760, he moved to London and started working as a printer again with William Strahan. During this time, a group of Scottish Masons living in London decided to form a new Lodge. On April 20th, 1763, Lodge #111, under the jurisdiction of the Antient Grand Lodge, was constituted at the "White Hart" in the Strand. It is thought that Preston was initiated at this time. On November 15th, 1764, this Lodge would change their changed allegiances and Lodge #111 would become Caledonian Lodge #325 under the "Moderns" or Premier Grand Lodge. This Lodge is still in existence today, but is numbered as #134 on the present registry of the United Grand Lodge of England. Preston began an extensive program of masonic research which entailed correspondence with Masons from around the world. Through this he built a large amount of Masonic knowledge and started organizing lectures attached to the 3-degrees of Freemasonry. He started meeting with friends a few times a week to present and refine his presentations which culminated on May 21st, 1772, where he held a Gala at the Crown and Anchor in the Strand. Here he presented his lectures to several prominent Masons and Grand Lodge officers. The success of this presentation led to the publishing of "Illustrations of Masonry". This publication would serve as the basis for several monitors. His efforts would earn him an appointment as Deputy Grand Secretary. Preston was elected, in absentia, in Lodge of Antiquity (one of the founding Lodges of the first Grand Lodge). This Lodge was suffering and declining so they wished Preston to help turn the Lodge around. He was eventually elected as Master of the Lodge and the Lodge did indeed flourish again. Some members were not pleased with the policies of Preston and eventually he would be expelled. This resulted from the events of December 27th, 1777, when some members of the Lodge of Antiquity, including Preston, returned from church wearing their Masonic regalia. The incident was reported by some unhappy Brothers and when Preston stated that the Lodge only had to prescribe to the original Constitution of the Premier Grand Lodge, and not any of the subsequent rulings due to its seniority, he and his supporters were expelled in 1779. It would be 9-years until the dispute was resolved and Preston was brought back into Freemasonry, and reinstated to all of his Honors. During his expulsion, his literary contributions reduced. Preston took no part in the unification of the Antients and the Moderns in 1813. William Preston died on April 1st, 1818, as a result of a long illness, and was buried in St. Paul's Churchyard. He left a sum of money to the Grand Lodge, to provide for an annual delivery of a lecture; the lecturer to be appointed by the Grand Master. Although his Masonic journey had moments of controversy, he still contributed a great deal to the cultivation of Masonic education. Preston also had a major impact on the moving Freemasonry away from the Taverns and the dinner appeal, and giving it a deeper appeal for esoteric studies, as well as moving meetings to dedicated Masonic buildings.